Reports will be coming home on Friday. Please follow the procedure on the letter accompanying the report to book an appointment to meet your children’s class teachers for Parent Consultations on either Wednesday 9 or Thursday 10 November from 3.30pm – 6.00pm. The slip should be give to the teachers by Tuesday 8 November. Poppies will be on sale in the school this week. They will be brought to the classes each day when the children will have an opportunity to purchase a poppy if they wish to bring in a donation. Please return the filled shoe boxes to school by FRIDAY 4 NOVEMBER. We cannot send the boxes if there is no £2.50 to cover the transport costs, so please only send in shoeboxes with the accompanying £2.50. To tie in with Road Safety Awareness Week at the end of November we would like the children to wear a BRIGHTLY COLOURED or FLUORESCENT accessory to school on Friday 25 November – this could be a scarf, some socks, gloves or hat etc. We would ask that a donation of between 50p – £1.00 be handed to the class teacher on that day. The donations will go to ‘BREAK’ – the road safety charity who help people who have been injured or support families of those tragically killed in road accidents. This campaign has now finished, but if you have any vouchers we can still collect them in the office until 18 November. The Friends would like to let parents know that Class DBGM & GAJB’s cake stall raised £88.10. Thank you to everyone who baked for this event. Atlas Fram have written to ask that we please remind parents not to park on their premises in New Road, or to block access to their car park as the site is in use with vehicles continuously. In addition, they are concerned that pupils from local schools are using their car-park as a cut through having no regard for driver blind-spots. For the safety of the children please can we ask that if any of your children do walk to school that you ensure they do not cut through this busy site. Thank you. Class DB Share Afternoon 'Goes Down' Well! We had a huge turnout of parents and grandparents to our Share afternoon last week. The theme was on Forces - looking at Gravity and Air Resistance in particular. The children and adults made helicopters, parachutes and paper planes. The helicopters and parachutes were tested (with a stopwatch) down the stairwell. The paper planes (various shapes) were tested on the playground to see which ones flew the furthest or stayed in the air the longest. Children from 4 Suffolk Schools. The Archbishop of Canterbury talking to some of the children inside Westminster Abbey. 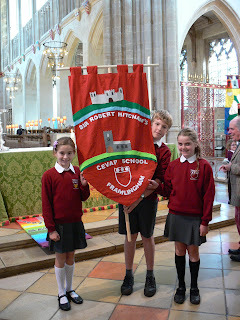 Ben, Emily and Lucy went to Bury St Edmunds cathedral for a special service for 200 years of Church Schools. 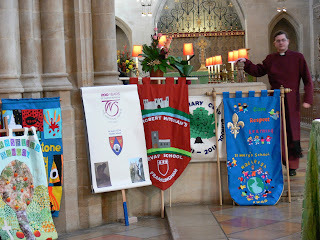 At the start we paraded the banner through the middle of the cathedral. The bishop put the banner at the front of the cathedral. We went to the side of the cathedral and some people explained why we had this birthday. We watched some dancing which was very good. A reading was read by a nearby school. Here are some photos of the day. Clio is now at University in London. During the last year she has become a junior British and European Champion. Community Volunteer of the Year Award. We require slips returned for the Christmas lunch choice for EVERY CHILD please, by the end of the week at the latest. If we do not receive a slip from you we will ASSUME THAT YOUR CHILD WILL BE HAVING A CHRISTMAS DINNER which will need to be paid for in December. Thank you. Please return the filled shoe boxes for Samaritans Purse by Friday 4 November, don’t forget to include the £2.50 in the envelope. Thank you. Please find with this letter the new menus that start after half term and carry through until Easter. On the first Friday back after half term the catering team are providing a Bonfire Lunch of Hotdog or Cheddar Cheese Catherine Wheel, Sauté potatoes, sweetcorn and peas, with Banoffee Pie for dessert. To access the menus on line visit www.eats-catering.co.uk here you can also find out nutrition and allergen information. Photos of all individual children and family groups will be taken on Thursday, all children will need to wear their school sweatshirts. Thank you. Parents of GAJB are reminded to come along to this Friday’s share session at 1.20pm. Poppies will be on sale in the school after half term. They will be brought to the classes each day when the children will have an opportunity to purchase a poppy if they wish to bring in a donation. We have placed a draft version of our policy on the school website as a ‘discussion’ document. We welcome any parent comments to the school office or via email to c.miller@hitchams.suffolk.sch.uk; the consultation period is now to 7 November 2011. We are sorry, but due to a shortage of available musical staff we are only able to now offer Recorders to Year 3. Mrs Hopkins and Mrs Eyles will be running this on Wednesday lunchtimes. Separate letters are being sent to Year 3 pupils this week. Reports will be coming home on the Friday after half-term (4 November), along with the report you will find a slip to be returned about booking an appointment to meet with your children’s class teachers for Parent Consultations on either Wednesday 9 or Thursday 10 November from 3.30pm – 6.00pm. Please return this slip by Tuesday 8 November. The Friends apologise for not making it clear that any orders for Yellow Moon craft products (from the catalogues handed out recently) need to be made direct to Yellow Moon, not via the Friends. Thank you. 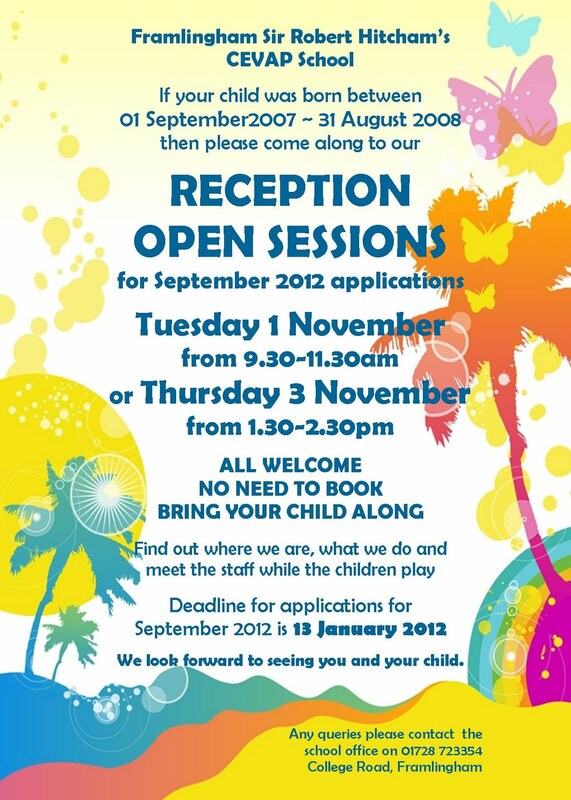 The Reception classes will be open for visits by parents with children due to start school next September. The sessions are on Tuesday 1 November 9.30-11.30am or Thursday 3 November 1.30-2.30pm. Parents are asked to please sign in at the school office where admission application forms are available. I am pleased to inform parents that Mr Snowden will be taking over Mrs Spencer’s class whilst she is on Maternity leave. He joins us after half term. I am sure everyone will join me in sending best wishes to Mr and Mrs Spencer for the birth of their second child. Last Friday Revd Owen and I accompanied 7 children from our school to London where we took part in the National Celebrations for the 200 years of Church Schools at Westminster Abbey. We were very honoured to be chosen to take part in these celebrations along with 3 other schools in our Diocese. Revd Owen and I were so proud of the children - Amy, Eleanor, Isabel, Lucy, Oscar, Sam and Zac – who were wonderful ambassadors for our school. As part of the national celebrations for Church Schools on Sunday 16 October Ben, Lucy and Emily from Year 6, with their families, joined a great number of other Church Schools at St Edmundsbury Cathedral. 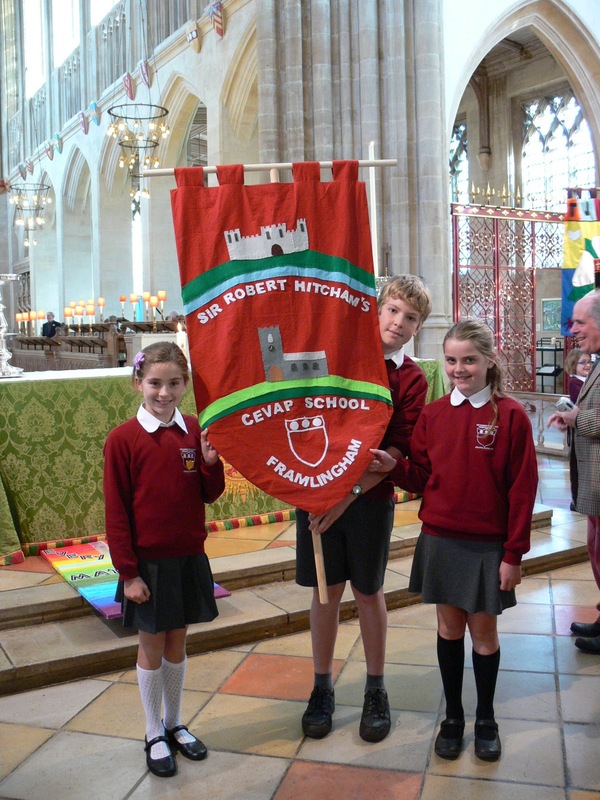 They carried our new school banner in the procession during a service led Bishop Nigel Stock. It was a wonderful event re-affirming the very special place of Church Schools in Suffolk. Our three representatives carried our banner with purpose and pride. On Sunday 16 October Mr Brook and I represented our school at the Ipswich and South Suffolk School Sports Partnership awards. We were proud to have been shortlisted along with 2 other schools; although we did not win the award it was an honour to be recognized as one of the great sports provider schools. My grateful thanks go to all the staff, past and present, who made our nomination possible. Half term commences on Monday 24 October, the children return on Monday 31 October. Yesterday afternoon saw the annual primary schools tournament held at Stradbroke High School. There were 12 large schools teams divided into 2 groups. Our B Team had a great time winning their group with 4 wins ( vs Wilby, Laxfield, St Aspal and Fressingfield ) from their 5 matches. Credit must go to captain Guy Blades for his outstanding leadership and most of the B team goals. Thanks also go to Mr James Cantrell for coaching and managing our B team. Several members of the team are in year 5 so will look to get into the A side next year. Our A Team started well with a 4-0 win against St Aspal but followed this up with a poor performance v Mellis (losing 2-1). This was followed by a frustrating 0-0 v Debenham. Despite dominating possession Fram could not beat their keeper and had to settle for a 0-0 draw. This meant that 2 good wins were needed to get into the semi finals. The boys now started to really play well to beat St Botolphs 4-0 and Fressingfield 6-0 to finish runners up in their group. This meant that the 2 Framlingham teams played each other in the semi. The other semi was between Debenham and Stonham. Fram A ran out 3-0 winners to progress to the final v Debenham. It proved to be a dramatic final. Fram had all the early chances with Oli Smith going close several times. Debenham then took the lead through their only shot at our goal. Oli scored a well deserved equaliser in the last minute. This took the game into extra time. Fram again created plenty of chances with the best one falling to Daniel Smith in the last few seconds. However, the excellent Debenham keeper kept the shot out. We then had a penalty shoot out. Fram captain Jake went first and scored, followed by Oli and Daniel. Debenham also scored all 3 of their kicks. It was now 'sudden death'. Eddie Pocher volunteered to take the penalty and confidently tucked it into the corner. Now it was David Dyer's turn to be the hero. He saved the next Debenham kick to make Fram the champions. This lovely bannered is the product of a huge amount of team work. KS2 children came up with ideas (drawings) and Mrs Dwyer put them together into one design. A group of children then cut out all of the various parts of the design and a team of adults (Mrs Turner, Mrs Pascoe, Mrs Borg, Mrs Spencer and Mrs Reeve) did the sewing. The 3 children pictured above will be carrying the banner in a special service in Bury Cathedral this Sunday. Mills captain, Jake, in action. These great action shots were taken by Mrs Haywood. The winning Mills team in front with runners-up Hitcham stood behind. It’s that time of year again, when we need to place our order for the Christmas turkey in order to meet SCC Catering deadlines! The school Christmas Lunch will be on Wednesday 14 December. It is a fun and sociable event and children are invited to join in even if they do not normally have a school meal. The vegetarian alternative will be ‘Chickpea Wellington’. There will be NO Nursery Lunch Club on this day. Children choosing to bring a packed lunch will eat in the hall with everyone else as usual. Please return the slip by Tuesday 18 October at the latest, if you select a Christmas dinner, we are afraid that you will not be able to change your mind nearer the time. Please pay on Monday 12 December if you are having a school lunch. The cost of Christmas Lunch will be £3.00. If your child is entitled to free school meals, there is no charge. Just a reminder this session for Nursery parents is on Tuesday 18 October from 9.30-11.30am. Parents are permitted to sign their Year 6 child out of school during the day of Wednesday 19 October to take them to look around the High School. Please ensure that you sign them back in when they return. Next Thursday, 20 October, photos of all individual children and family groups will be taken. The children will be photographed in their school sweatshirts. If you wish to bring pre-school children into school to join your family group photo, please come to the hall at 8.30am. Reminder that SCC Catering have cancelled Apple Day lunch next week and we will be having a Bonfire lunch on 4 November instead. 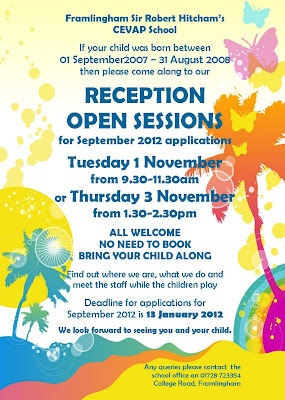 HIGH SCHOOL PLACE FOR YOUR CHILD BY MONDAY 31 OCTOBER. Either apply online at www.suffolk.gov.uk/onlineadmissions or fill in the CAF1 form sent home with your child earlier in the term. Please speak to Mrs Miller at the office if you have any queries. We have recently received information about the 2012 Young Art East Anglia competition. If your child would like to take part in this, they should produce a piece of art work on the theme of “Fun & Games”, using any medium except bulky collage. It should be no larger than A3 size and must not be mounted or laminated. The entry must be accompanied by a minimum donation of £2.00 which will help to raise money for Cancer Research UK, and the child’s name, year and school name must be printed clearly on the back. First, second and third prizes are to be awarded in each age-group (Reception to Year 2, Years 3-4, Years 5-6) and all prize-winning entries, as well as a percentage of pictures from each school, will be included in an exhibition at the Peter Pears Gallery in Aldeburgh from 9-11 March 2012. Postcards of all exhibited work will be for sale at the exhibition. To have exhibited artwork returned it will need to be purchased at the Gallery. Please hand all entries in to our own school office by Friday 13 January 2012. The clergy at St Michael’s Church would like to say how lovely it was to see the pets at their service last week, and that as a result of people's generosity they have been able to send a cheque for £25 to St Mungos. They plan to have another pet service next October. 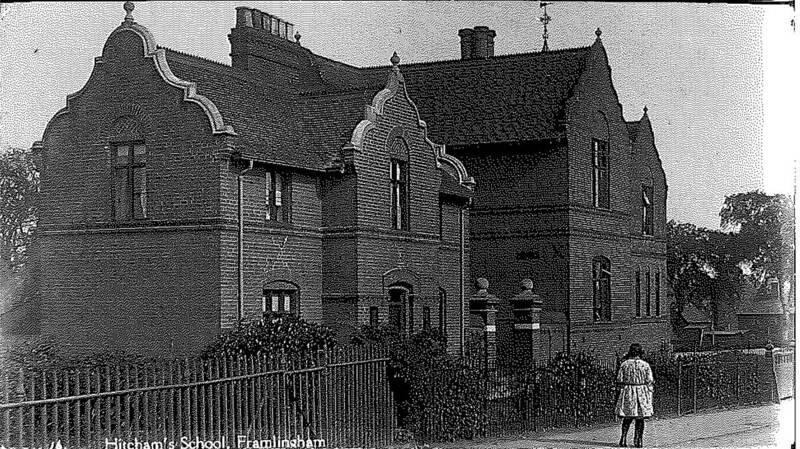 A special assembly was held this week to celebrate SRH Framlingham's role in 200 years of Church schools in England. The celebration was led by the Deputy Director of Education for the Suffolk Diocese - Mr Gourlay. Key Stage 1 children made their own candles and read some prayers. Our house captains made presentations about our school history. We were presented with a special clock and candle marking 200 years of church schools. To see the House captain presentations - see the next post on the Blog. 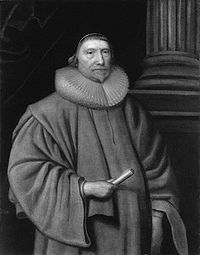 Our school is actually over 350 years old - thanks to Sir Robert Hitcham. Our Harvest Festivals were held last week in St Michael's Church Framlingham. SRH Framlingham has been short listed (along with 3 other schools) for the County Sports School of the Year. Mr Brook, Mrs Picton and Mr Vaughan will be going to a ceremony at Trinity Park, Ipswich on Sunday 16th October. After such a brilliant year of sport throughout our school (clubs, houses and school teams) we are hoping to do well. We will let you know how we get on. This festival takes place in the Aldeburgh area from October 15th - 29th. This includes the half term week. Click on the logo to find out more details. Here are a selection of photos from the first round of inter house football matches. After this first set of games, Hitcham and Mills are tied on 7 points, with Bulstrode in 3rd place and Howard in 4th. This Friday the teams play each other again. There is an interschool tournament next week. It is essential that we maintain accurate up-to-date pupil data, especially for emergency contacts and medical details. With this letter please find a copy of the latest pupil data we have for your child/ren. Please return the signed data sheet to us no later than Tuesday 11 October. Please return the filled shoe boxes to school by FRIDAY 4 NOVEMBER so that we can arrange collection. THANK YOU. 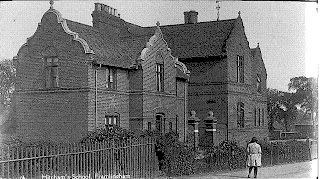 The Deputy Diocesan Director of Education will be joining our school family for an act of Collective Worship to celebrate 200 years of Church of England Schools this Wednesday. Please can we ask parents not to come into school after the 8.45am bell goes. If your child has not had time to take their bags in before lining up, please just give them their things to bring in as they line up. We are aiming to encourage independence and to also reduce the congestion in the corridors. Thank you. The Friends have sadly been unable to secure a suitable film for a Film Night this term, however they hope to sort one for early in the New Year. Thank you to everyone who brought in donations for the Harvest Festivals last week. The food items have been taken to West Villa Homeless Families Unit in Ipswich, in addition we received £200 from the collection which will go to the Soup Kitchen in Ipswich. We are fearful of the safety of the children in the morning on New Road, we are finding again that parents are pulling up or parking on the double yellow lines, in the school drive or in front of the cycle shop. All this causes dangers for the families trying to cross the road and to get safely into school as it restricts visibility and causes other drivers to pull out to accelerate past. Please can we ask that you find a safe place to park in the morning that will not cause a danger. CELEBRATION ASSEMBLIES – QUIET PLEASE! I was disappointed that some parents were chatting during class CA assembly last Friday. We do expect the pupils to be quiet during assemblies and show respect to the class or teacher leading the assembly, it is difficult to enforce this if there is noise coming from families. The children work very hard to prepare themselves for their class celebration assemblies and we would ask that if you have come along to see your child present, that you do remain quiet and not cause a distraction. Please can we also remind you that if you have to bring younger siblings to the assembly we would ask that you take them out of the hall if they start to cause a disturbance. Thank you for your co-operation in this. The Friends are delighted to announce that November's event will be a Christmas Craft Market. Based on feedback from last year's shopping evening, we have decided to make this an event for the whole family to enjoy, with a smaller selection of stalls, focussing on handmade, unique and affordable craft items, as well as some traditional Christmas Fair activities for the children/adults, such as a raffle, tombola, Guess the weight of the Christmas Cake and meet Santa in his Grotto. We already have a number of stalls allocated but if you have a talent for making beautiful craft items and would like a stall at the event, please contact Catherine Hill (07977 206587). The Friends would love to hear from you. Friday 18 November. The children may come to school in their own clothes in return for a donation to the Christmas event. bottles of wine or alcohol. Mince pies and cakes should be brought in on the morning of the event – 25 November. All alcohol / bottles should be handed in at the office. ORCHESTRA – ANY MORE INTEREST? Sadly, we have only had a small response to the Orchestra, if anyone else is interested please do fill in a form from the office – it’s not too late. Thank you.